TiDB acts like it is a MySQL 5.7 server to your applications. You can continue to use all of the existing MySQL client libraries, and in many cases, you will not need to change a single line of code in your application. Because TiDB is built from scratch, not a MySQL fork, please check out the list of known compatibility differences. 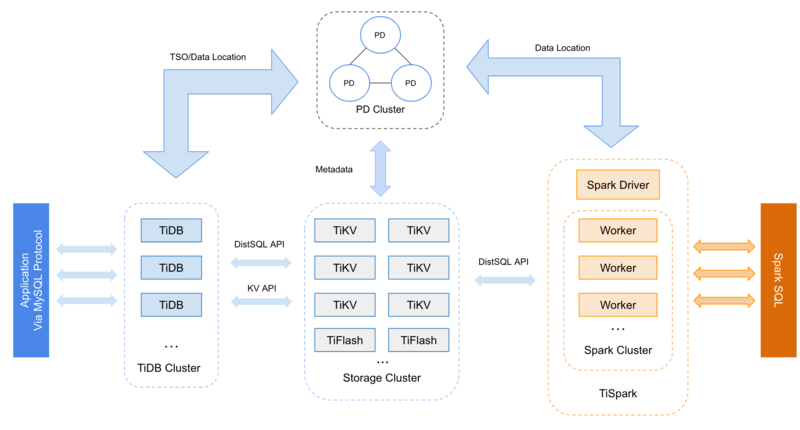 The storage layer of TiDB, called TiKV, became a Cloud Native Computing Foundation member project in 2018. The architecture of the TiDB platform also allows SQL processing and storage to be scaled independently of each other in a very cloud-friendly manner. TiDB uses the Raft consensus algorithm to ensure that data is highly available and safely replicated throughout storage in Raft groups. In the event of failure, a Raft group will automatically elect a new leader for the failed member, and self-heal the TiDB cluster without any required manual intervention. Failure and self-healing operations are also transparent to applications. For more details and latest updates, see official TiDB blog. View the current list of in-production TiDB adopters here. Read the Quick Start Guide, which includes deployment methods using Ansible, Docker, and Kubernetes. TiDB is under the Apache 2.0 license. See the LICENSE file for details. Thanks cznic for providing some great open source tools. Thanks GolevelDB, BoltDB, and RocksDB for their powerful storage engines.